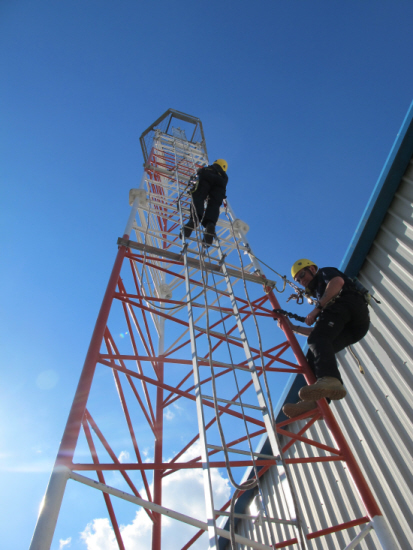 Course introduction A 2 day course aimed at providing information and training for a worker who wants to access and work in either protected or unprotected areas using fall arrest or restraint equipment. The student needs no previous experience, but the student must be comfortable at working at height. It looks at many of the safe systems of work needed to gain access in the telecoms and construction industry. Course content Categories of Heights-Working at Heights Legislations – Hierarchy of Measures – Hazard Identification – Risk Assessments – Basic RF hazards – Emergency considerations – Access and Egress implications – Correct selection of PP – Daily Inspection procedures of PPE – setting up safe systems of work – Use of Work positioning – Work restraint and fall arrest equipment – Safe climbing techniques on fixed ladders and external structures, masts and towers – basic knots – basic anchor systems – Basic safe lifting techniques.